Google rankings are mostly based on PageRank and relevancy. PageRank is the core of Google’s algorithm, and it is a measure of the backlinks profile each page on the internet has. Relevancy is simply a measure of google for estimating how relevant your page is for a certain keyword. It used to be more about the volume in the past but not any more. Today, specially since the Penguin update in 2012, it is more important to keep you backlink profile clean. That means you should be very careful about which sites you get backlinks from. Those should be both good websites (more about that later), and relevant to your niche. So, if you’re a travel site, and you are offered a link from a powerful sports site, you might want to decline that offer. A link that pops out of nowhere. For example, within a post about coffee roasting, the “coffee” keyword is linked to a coffee shop in Boston without ever mentioning that business in the post. Now, let’s talk about what makes a good website. A good website, is a website that has a good link profile and Google trusts it. That means that both the incoming links to that website are good, and the outgoing links from that website are good. You could check that from looking at the site scores on MajesticSEO. They have measures called “citation flow” (the strength of the site’s backlinks) and “trust flow” (a number predicting how trustworthy a page is based on how trustworthy sites tend to link to trustworthy neighbors). Your competitors might have found some good source for backlinks. So, you should check the backlinks of your competitors. You can use SheerSEO pro features to see your competitor’s backlinks, or you could use MajesticSEO or AHrefs. 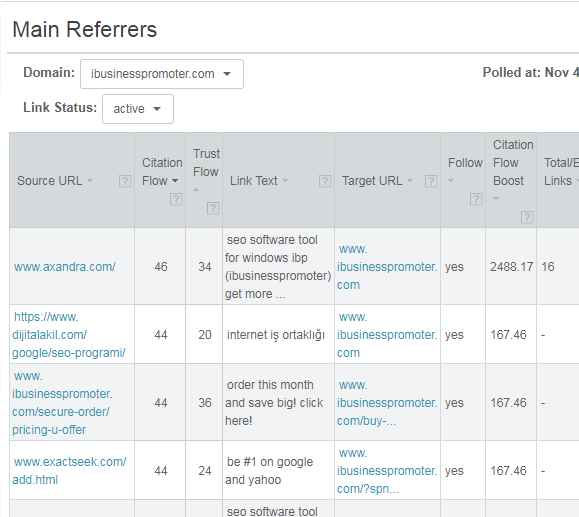 That will reveal your competitors’ backlink sources. Blogs are a great source for backlinks. The bloggers are looking for new content all the time, and some of them would be happy to mention your website. The best thing about blog posts, is that they might be the most natural links possible. This is not just a link, but a link embedded in relevant text, which is the most natural link you could get. Sometimes, you’ll have to give them something to convince them to link to you. That might be money, or some sample of your product. Still, could be worth it. SheerSEO has two features for searching and communicating with relevant bloggers. One feature is for free blog posts and the other is for paid blog posts and uses guest posting. Web directories are far from the most natural links to get these days. But the good thing about them is that you get a link quickly. Not a great value link, but still the price reflects that. You can either find free web directories and submit to them, which will take months and usually won’t happen at all, or try paying for it and have that link up in a few days. Up to you. SheerSEO has a feature for submitting to paid directories. This is really ultimate! Thanks Eyal for sharing your informative blog post about the good back links on the internet. Your post is very helpful for me as-well-as for other users who are still new to back-links and Google’s Algorithm. You post would be very useful for everyone! Keep up the great work!